June 24, 2013- There was high speculation that National Security Agency (NSA) leaker Edward Snowden was going to be on a Russian airline carrier, Aeroflot out of Sheremetyevo International Airport, Moscow bound for Jose Marti International Airport (HAV) Havana, Cuba this morning (eastern standard time) Where Snowden was to then take a later flight to Quito, Ecuador where he hoped to receive asylum in his attempt to evade espionage charges by the U.S. Justice Department. However, the Airbus A330-200, Flight SU150 departed at 2:45 PM MSK (Moscow Standard Time) and there was no sign of Snowden. The government of Ecuador has indicated that it is reviewing Snowden’s application and is considering asylum for the 30 year old former technical contractor and Central Intelligence Agency (CIA) employee who worked for Booz Allen Hamilton, a contractor for the NSA, before leaking details of classified NSA mass surveillance programs to the press. At takeoff, reporters on Flight SU150 notice an empty seat which was believed to be a seat reserved for Snowden. 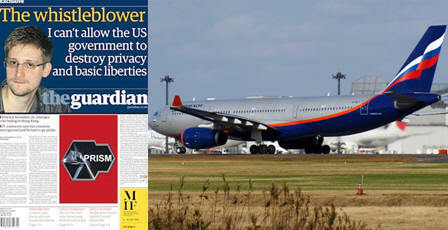 The Russian air career Aeroflot would not confirm or deny on whether Snowden was on that flight. On Sunday US officials said that Snowden's US passport was revoked. Ecuadorian foreign minister, Ricardo Patino, announced that Snowden had requested asylum in Ecuador, which has an extradition treaty with the United States. However, the Ecuador does allowed an individual who has been accused of having crimes "of a political character" to avoid extradition. Snowden has stated that he was more inclined "to seek asylum in a country with shared values." His first choice was Iceland. However, Icelandic ambassador to China, Kristin Arnadottir indicated that asylum could not be granted to Snowden because Icelandic law requires that such applications be made from within the country. Snowden's alleged leaks are said to rank among the most significant breaches in the history of the NSA. In May 2013, Snowden requested a medical leave from work at the NSA in Hawaii to seek treatment for epilepsy, shortly there after Snowden and his girlfriend boarded a flight for Hong Kong. In June, news reports began to surface on the NSA. These leaks would later be confirmed by Snowden as leaks reported by him to the press. On June 5, it was reported that the Foreign Intelligence Surveillance Court (FISC) ordered Verizon to provide "on an ongoing daily basis" metadata for all telephone calls “ within the United States, including local telephone calls” and all calls made “between the United States and abroad” (reported by The Guardian a British national daily newspaper). On June 6, it was reported that the NSA has a electronic surveillance program that allows the NSA to access e-mail, web searches, and other Internet traffic in real-time (reported by The Guardian and the Washington Post). On June 9, it was reported that the NSA was collecting information that "details and even maps by country the voluminous amount of information it collects from computer and telephone networks (reported by The Guardian). On June 12, it was reported that the NSA was hacking into computers in China and Hong Kong since 2009 (reported by the South China Morning Post). On June 17, it was reported that the Government Communications Headquarters (GCHQ), a British intelligence agency, had intercepted foreign politicians' communications at the 2009 G-20 London Summit (reported by The Guardian). On June 20, it was reported that two secret documents, signed by Attorney General Eric Holder described the rules in which the NSA determines whether targets of investigations are foreign or domestic (reported by The Guardian). On June 22, it was reported British Government Communications Headquarters (GCHQ) operated a program called operation 'Tempora' in which the UK government would massive interception of fiber-optic traffic and share with the NSA (reported by The Guardian). On June 23, it was reported that the NSA had hacked Chinese mobile phone companies in order to collect millions of text messages and has also hacked Tsinghua University in Beijing and the Asian fiber optic network operator Pacnet (reported by The Guardian).